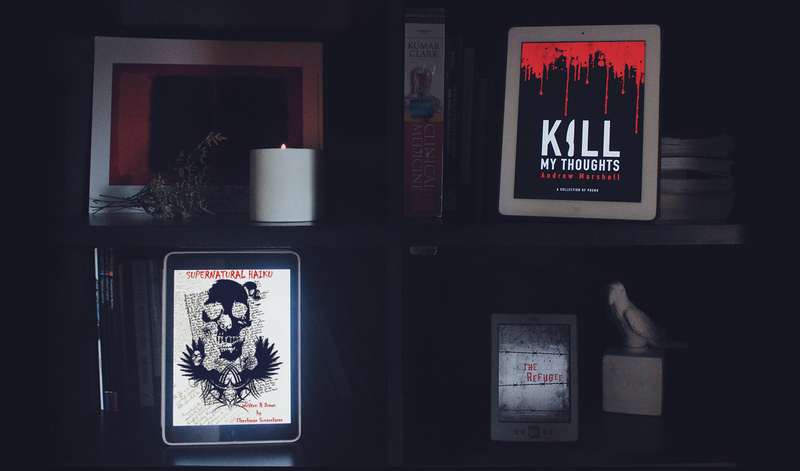 Whether you’re in the mood for edgy, dark writing that will get under your skin and make you think, or you’re a fan of things grim and horrific, we’ve got just the selection of ebooks that fit the bill. Interestingly, all our titles in this genre so far are anthologies of poetry. The poets themselves are just as interesting as their dynamic works! Elancharan Gunasekaran is a prolific artist and poet. He’s authored several collections of poetry, has had his work published internationally on digital and print platforms, and is an active part of the literary community in Singapore. Andrew Marshall is an emerging poet who runs the poetry group Night Light Poets. As ever, we’re so glad to be a part of their artistic journeys and to support their talent It’s very inspiring to have witnessed their growth, passion for their craft, and immense resilience. Supernatural Haiku is a collection of horror haikus, created and inspired by the supernatural beliefs in societies all around the world. Crafted with sheer poetic intensity these haikus will take you into the darkest parts of the unforgiving underworld. Be prepared to BELIEVE and BELIEVE that we are not alone in the night. Supernatural Haiku is Elancharan’s first collection of poetry. His poetry works “Black & Gold” and “The Tormented” have been published online in Miracle E-Zine and showcased on the Mini Operas website respectively. Do the walls seem to close in around you? Are you trapped by overwhelming ideals? Escape, might be your only solution. Explore the world of a Refugee in first person as you unravel pages of freedom, motive and escapism. Be ready to be lured by propaganda laced words of conflict and politics as the refugee in you longs to break free. Open your minds to the poetic madness set before you, nothing will ever be the same. For those with a predisposition to all things dark, even macabre, this collection of poems is sure to please. While the poems delve into universal themes such as love, longing, hope, anger and vengeance, everything is tinged with the poet’s signature dark shade. Through his poems, he dissects the lives of people who we often neglect to see – the marginalised, the wounded, who are trapped in predicaments that are difficult to escape from.